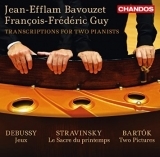 Gramophone's Harriet Smith says: "The Frenchman knows exactly what he is doing: the finale is a masterclass in precision and clarity, even at speed, its more lyrical writing brought fully alive." 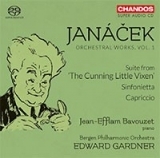 "..the highlight in this performance comes in the central Andante where soloist, conductor and orchestra conjures up a magical sound world.."
"As before, the score is a starting point for him, not holy writ, and he grants himself full liberty to negotiate with Haydn, ornamenting and varying as he goes along, yet never obscuring the music’s purpose or pulling the spotlight away from it and towards himself. 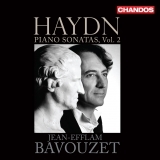 ..this volume is another stepping stone towards what must surely end up as a major modern recording landmark in the Haydn discography." Colin Anderson from ClassicalSource appreciates the composer and the performer: "Joseph Haydn and Jean-Efflam Bavouzet: all-round geniuses." 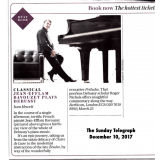 "there is an effervescence to this French musician that is simply irresistible"
"We heard spectacular playing throughout the day, but with the whole unbroken sequence of this book of Préludes our musical engagement was sustained and cumulative, making a brilliant conclusion to our Hommage. 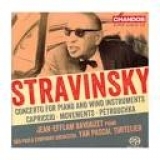 What a great composer, and what a great advocate for his genius." 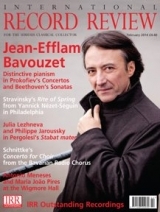 "Jean-Efflam Bavouzet 's vigorous reading of Grieg’s Piano Concerto, shading its flinty, self-serious motives with sparkle and wit." 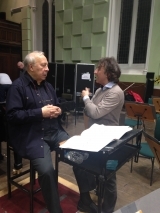 "he has treated us to magnificent recordings of, first, French repertoire and more recently the music of Haydn, Mozart and Beethoven. 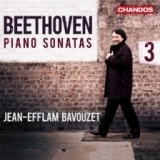 He is a pianist with so much to say, as witnessed by his deeply impressive Beethoven piano sonata series. " "Bavouzet casts magic over the orchestra’s background accompaniment with his faultless, seamless execution of passagework and his exquisite phrasing of melodies"
"Bavouzet brings erudition, insight and boundless energy to his complete cycle of Beethoven sonatas. 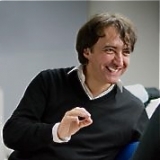 Jeremy Nicholas can't help but finding himself bowled over by the Gallic charm and boundless enthousiasm of this unique and stimulating talent"
" Bavouzet’s chronological cycle... has not been surpassed, I would judge, in the last 30 years. 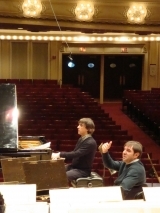 Yes, it’s that good..He radiates generosity and balance as well as a delight in being able to play the piano so well." 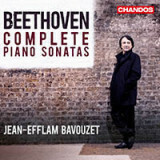 "JEAN-EFFLAM BAVOUZET'S BEETHOVEN: REFRESHING AND PROVOCATIVE"
"All Beethoven performances should, if only briefly, restore one’s faith in humanity; this one did... A Beethoven performance of undeniable greatness...Bavouzet’s way in general with these works was perhaps the most brazenly modernistic, both in sound and often in interpretative strategy..A performance Boulez would have admired"
A clever idea of Jean-Efflam BAVOUZET to gather on a record centring on Stravinsky as pianist, three major works, the Concerto, confronting if not reconciling Baroque and tango within a classical framework; the multi-serialist Mouvements, hard as a diamond; and the enjoyable Carpiccio, also acknowledging the piano origins of Petrushka. 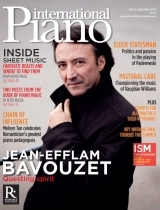 Andrew Clements in the Guardian: "Jean-Efflam Bavouzet is not only a dazzling soloist in the three concertante works, but adds two of Pierné’s solo piano pieces, the Nocturne en Forme de Valse and a concert study"
GRAMOPHONE Magazine EDITOR'S CHOICE August 2015! 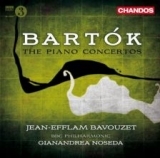 "..The colours, dynamics and textural finesse of this performance, enhanced by superbly lifelike recording, are breathtaking..."
"There was sparkle aplenty in Prokofiev’s Third Piano Concerto, too, but this time generated most obviously by some fairly stunning pianism from Jean-Efflam Bavouzet. 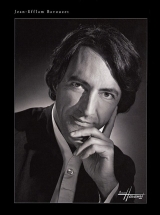 This often understated, always musical, pianist here turned into a dynamo, fizzing up and down the keyboard with the energy of a nuclear reaction. 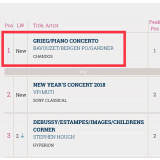 It was a cracking performance which, for energy and excitement, rivalled even Danil Trifonov’s EIF opener back in 2013, and that’s saying something." "Energy and precision from Bavouzet . It’s hard to imagine better." 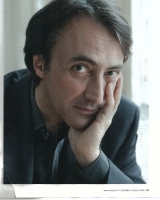 Charles Sigel invites Jean-Efflam Bavouzet for two hours of music and conversation. 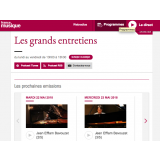 "C'est un des meilleurs pianistes actuels. Le monde entier le sait. Son pays, la France, un peu moins. Depuis fort longtemps, c'est ailleurs qu'il triomphe. 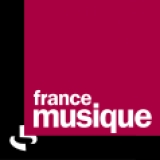 Rencontre avec un musicien boulimique, curieux de tout, enthousiaste et enthousiasmant." 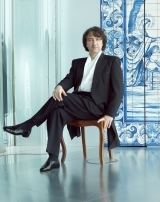 ...After this, the superb French pianist Jean-Efflam Bavouzet was soloist in Rachmaninoff’s Rhapsody on a Theme of Paganini. 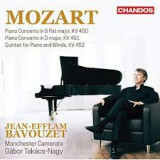 Those expecting a French artist to exemplify stereotypical French sensibilities, like refinement, might have been surprised by Mr. Bavouzet’s crisp, incisive playing. 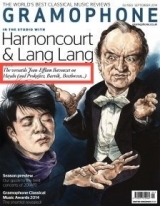 This was a bracing account of a familiar piece. 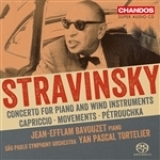 There was no dawdling in ruminative variations, and just enough use of expressive rubato in episodes of soaring lyricism. 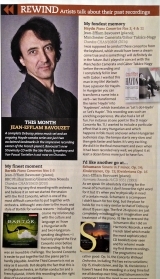 "Pianist Bavouzet makes a stunning return to Davies with the London Philharmonic"
JEB will be guest of Arièle Butaux in "Mardi idéal"
Prokofiev concertos cd RECORDING OF THE MONTH! 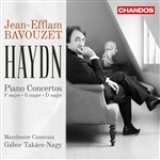 "Superb Prokofiev piano concertos cycle from Jean-Efflam Bavouzet"
"Bavouzet is on magnificent form"
"Après une très remarquable intégrale Debussy, Jean-Efflam Bavouzet a entrepris une intégrale des sonates de Haydn régulièrement saluée dans nos pages. 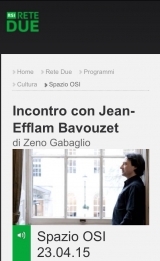 Rencontre avec un artist curieux de tout." 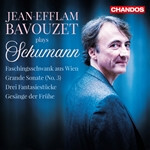 "A quite wonderful pianist - in his prime... the virtuosity often breathtaking but his control is as much musical as technical... Boundless musical energy and in everything offered him command of timing and of the glorious variety and drama of these compositions.."
JEAN-EFFLAM BAVOUZET IS CLASSIC FM ¨ARTIST OF THE WEEK¨ ! 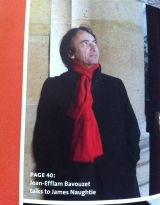 Issue 68 has somewhat of a French flair to it. 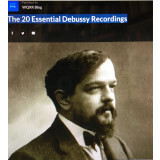 To mark the 150th anniversary of Debussy’s birth, we are devoting some of our features to French piano music. 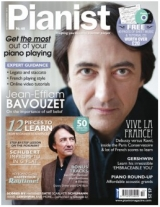 Charismatic Frenchman Jean-Efflam Bavouzet adorns our cover. 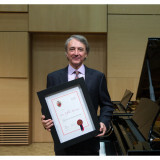 Over the past few years Bavouzet has made a real name for himself on the concert platform and in the recording studio – his recordings of French piano music have won numerous awards. 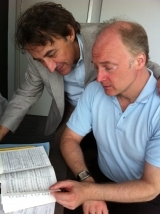 Inge Kjemtrup catches up with him between recitals at London’s Wigmore Hall. 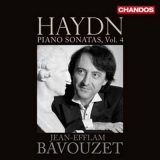 HAYDN Piano Sonatas Vol.4: "This is among the finest accounts on disc"
Bayan Nothcott enjoys Jean-Efflam Bavouzet's stunning sonata recital: "Among the finest accounts on disc: searchingly nuanced"
"This is among the finest accounts on disc: searchingly nuanced from moment to moment yet never losing its grip on the work's tragic progress. 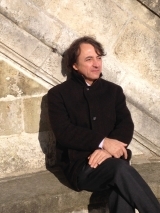 Bavouzet's reading of the three selected Sonatas in this latest instalment of his ongoing series are all equally illuminating in different ways. 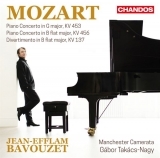 He's wonderfully dry and droll in the opening movement of the early Sonata No.30, and dazzling in the quick changes of its rondo-variaton finale. 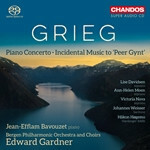 He brings an almost Chopinesque resonance to the lilting Siciliana-like Adagio of the Sonata No.38 and crisp grandeur to the discursive opening of the more popular-style Sonata No. 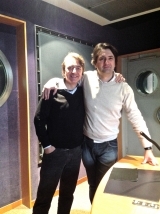 40." 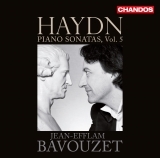 Haydn: Piano Sonatas Vol.4 is out ! 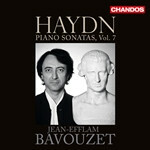 "it is certainly worth acquisition not only for Bavouzet's positive assets as outlined above, to which can be added a generous dose of wit and sparkle but also, of course, for the marvellous music it contains.The F minor Variations may well be familiar as one of Haydn's greatest keyboards works, with their huge and sombre coda finally dissolving pianissimo. 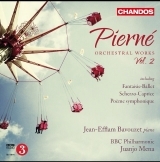 The composer's designation of them as Un piccolo divertimento must have preceded the actual work of composition! 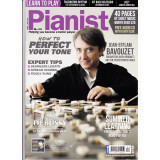 WHat ingenuity and originality and teasing of player and listener alike there is in the sonatas that Bavouzet has carefully placed alongside each other." 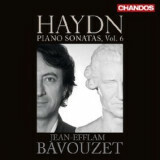 Vote for Jean-Efflam Bavouzet as Gramophone Artist of the Year 2012 ! 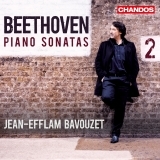 Jean-Efflam is shortlisted by GRAMOPHONE for being Artist of the Year 2012 in the exclusive company of today's greatest artists. Voting closes on August 27, so please vote and spread the news! 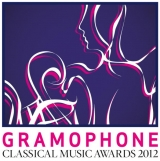 The International Classical Music Award ceremony took place in Nantes May 15th 2012 featuring Orchestre National des Pays de la Loire, John Axelrod conducting The gala concert was broadcast live on France Musique. 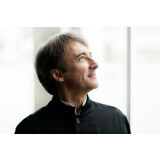 Previous "Artist of the Year" was Esa-Pekka Salonen. 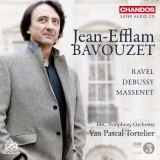 Already winner of the Gramophone Award 2011, the CD of the Ravel concertos and the Debussy Fantaisie received on April 12th 2012 the BBC Music Magazine Orchestral Award of the Year. To see all the winners click on the link below. "The first installment was dazzling, and the second is too..."
Jean-Efflam Bavouzet embarks on a tour of Canada and the US with Orchestre National de France under the direction of Daniel Gatti, performing Beethoven Piano Concerto No. 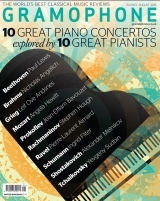 3 and Ravel’s Piano Concerto in G. Concerts include performances in Ottawa’s National Arts Center, Montreal’s Place des Arts, Chicago’s Symphony Center, Philadelphia’s Kimmel Center and the Avery Fisher Hall in New York.